West Rajasthan is arid and the living conditions, hostile. The vagaries of the desert environment with temperatures exceeding 45 degrees in the summers and extreme fluctuations in temperatures during day and night aggravate the situation. Extreme variations in the precipitation and rainfall levels cause frequent droughts (40 times in these last hundred years). This kind of infrequent and erratically distributed rainfall and insufficient water for irrigation cause not only loss of livelihood, but also make the people and livestock prone to health hazards. People use canal water directly for drinking. The study ‘Water and Health- of the IGNP’ found that 70.6% of the people surveyed were afflicted with diseases due to bacterial and heavy metal content in the water of the canals. The area is also considered to be a fluoride ridden water zone with high content of gypsum. The situation is further compounded by lack of proper storage facilities both at the family and the community. Water quality test/surveillance in program areas are regularly facilitated. Check Damns, their creation and maintenance is facilitated in the region. 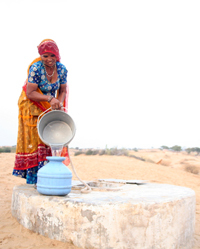 The community is motivated and trained at managing their natural water resources like wells, Kunds, etc. and are encouraged to create new ones using traditional means and knowledge. Awareness drives to keep the water and storage areas clean is regularly facilitated. Open defecation is discouraged and toilets and their importance is emphasized upon.